I received the call from my father, “Grandpa Henry passed away last night.” While it wasn’t unexpected – he was 94 and I was aware he had been declining – it was still sad news, as I loved him dearly. 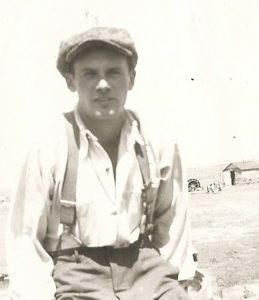 My Grandpa Henry was a farmer. His family were homesteaders in Vibank, Saskatchewan. They broke the land, they built homes and barns, they raised animals, and they laid the foundation for their community. Henry loved being a farmer, through good times and bad, and over his lifetime he saw incredible changes in farming and in society. And while being a farmer was his great passion, he was very much a man of faith, a man of family, and a man of virtue. Grandpa Henry was a great leader. While Grandpa Henry probably would have had no idea who John Wooden was (Henry wasn’t really a big sports fan), I can say that Grandpa was truly a great leader because he brought out greatness in me. Some of my most cherished childhood memories involve time spent with him. In the summers when I was not yet even a teenager, my parents would often send me for a week at a time to my grandparents’ home. Perhaps this was to give themselves a break, but for me it was an adventure – a time for me to grow, to learn, and to be myself. I remember at 12 years of age, Grandpa let me drive his blue Chevy half-ton in the fields as we went out to check the crops. It was thrilling to be entrusted with driving this massive machine, especially compared with my usual BMX bike. He was patient and instructive as initially I hit the gas and brakes a bit too hard. However, in a short time I had mastered the half-ton – so he introduced me to the John Deere tractor and the two-ton grain truck. The grain truck was a bit tricky to shift, but again with time, I grew in confidence and independence. Now these weren’t just joy-rides. Grandpa invited me to work with him and my uncle Ted to help bring in the harvest. Here I was, a very young man, just 12 years old, hauling the grain back to storage bins from the fields where he and my uncle were operating their combines. Grandpa afforded me incredible privileges, while at the same time he invited me into adult responsibilities. He had confidence in me. He believed in me. He brought out the best in me. We worked long days. While other kids may have been sleeping in on their summer vacation, Grandpa Henry was waking me up at 6 a.m. and when the weather was good, we would often work long into the night. His leadership inspired hard work in me as I worked with him and witnessed his commitment and dedication. But it wasn’t all work. Grandpa also enjoyed a good game of cards – Schmier to be precise. Schmier is a game that involves a bit of skill, a bit of luck, a bit of teamwork, and a bit of gambling. He taught me how to play in those early years and we often enjoyed many a game at family gatherings. I especially enjoyed being partners with him at the local Seniors Center where we would play for nickels. I felt so proud to play together as his partner and we usually came away a few dollars richer. Grandpa was a prudent player, yet knew the right time to take risks. At times when I was a bit hesitant, he would challenge me, “So are you gonna bid?” Sometimes I would chicken out and pass, but other times I might bid really high and in the end, make just enough points to win the hand. Grandpa’s light-hearted encouragement invited me to take risks, step out and maybe even out-bid an overconfident uncle on a particular hand. Over the years, we likely played hundreds of games of Schmier. And although it was all in good fun and the stakes were never that high, Grandpa’s leadership taught me to have courage, take initiative, and at the right times, to take risks. There are many other memories I have of those early years, but my most recent time with him is one that I will never forget. 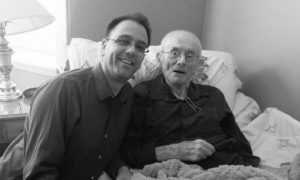 In April of this year I was in Regina for a number of business meetings, but arranged to spend a whole day with Grandpa at his Retirement Home. By this point life had taken its toll on him physically, and he moved much slower. We chatted for a number of hours on many subjects, mostly farming, but his memory was sharp as he asked questions about my own kids, his great grandchildren. We had lunch together but he struggled to feed himself. With great humility, Grandpa Henry accepted my offer to help feed him. I carefully made sure that I didn’t get any onions in the spoonful’s of potato salad I was giving to him, as he let me know he didn’t like the onions. In those moments while I fed him, Grandpa Henry gave me the great opportunity to serve him and to minister to him. This great man who had cared for me in so many ways, allowed me to care for him in this very simple way. By modelling humility and allowing me to serve him, he brought out goodness, and greatness, in me. After lunch I told him that I had visited Grandma Emily’s grave the day before and he asked if we could go to Vibank together to visit her and see the farm. I asked the on-site nurse who said it should be fine and providentially, my uncle Vern stopped by for a visit as well. So together Vern and I helped Grandpa to the SUV and we went for a drive.You could see how alive and energized his spirit was being out there. They say that a sign of greatness is gratefulness. As we drove, I could sense my Grandpa’s gratitude for all the good people, places, and experiences that his life as a farmer, friend, and family man had brought. Being with him made me reflect on my own life, my history, and the many blessings I have received. Being with him cultivated an even deeper gratitude in my own heart. After we returned back to the Home, Grandpa and I had one final hour together before I had to leave. He was very tired and ready for a nap, so I helped him into his bed and we sat together. It was around 3 p.m., the Hour of Mercy, and so I asked him if he would like to pray a decade of the Rosary together. He happily accepted and I began the prayers. I started the Our Father and he concluded it. As I began the Hail Marys, his voice responded much quieter. As we continued, his responses gave way to deep breathing and eventually, light snoring. I finished the decade with Grandpa sleeping peacefully. I looked at him for a while, gave him a kiss on the forehead, told him that I loved him, and slipped away. In my heart I think I knew that was going to be my last moment with him, even though I hoped for more. As it turned out, that was our last time together. In that final moment, he offered me the very best of himself – his gift of faith. Sitting at his bedside, praying with him, Grandpa Henry brought me deeper into God’s presence and God’s peace. Grandpa Henry brought me deeper into the Greatness of God. 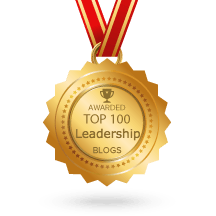 People define leadership in many ways, but I believe that authentic leadership is not about position or power. True leadership is exercised by those who look to bring out the best in people – to bring out greatness. Grandpa Henry was a great man. He was a great husband, a great friend, a great father, a great farmer, and a great leader. He brought out the best in others; he brought out greatness in others. I will miss him dearly as I loved him deeply. And while I look forward to seeing him again in Eternity, right now I will do my best to follow his example by seeking to bring out greatness in all those whom God has placed in my life. Henry Lockert was born on September 2, 1923. He died peacefully on October 22, 2017. He is survived by his 8 children and their spouses, twenty four grandchildren and forty great-grandchildren. 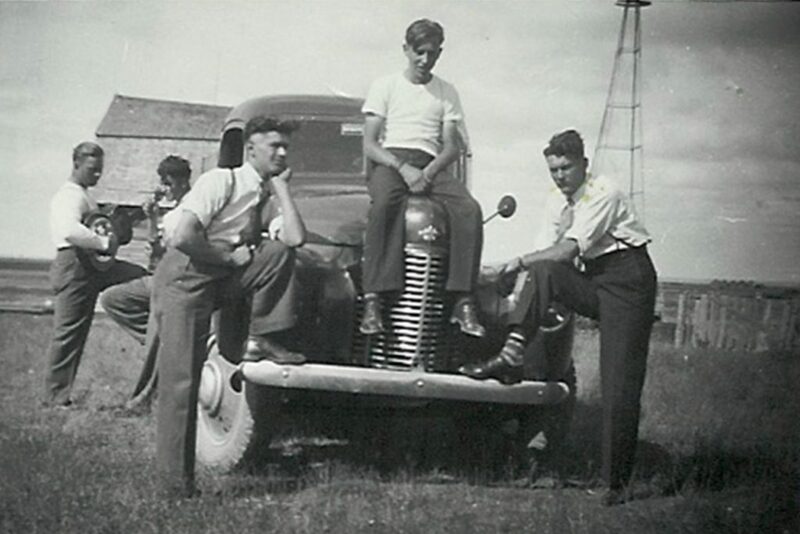 The photo at the top was taken in 1944 near the family farm in Vibank, SK. Henry is standing on the far right of the photo. 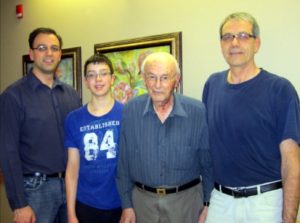 Four Generations of Lockerts: Jeff, Isaac, Henry, and Steve. 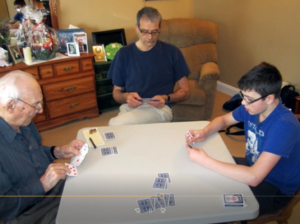 Grandpa Henry, Steve and Isaac playing Schmier. A young Henry taking a break on the farm. My last visit with Grandpa Henry in April 2017.